Surging ahead: Pedestrians walk past a share prices board in Tokyo on Thursday, the day Japanese share prices at the Tokyo Stock Exchange rose 396.48 points to close at 16,832.22, a six-week high. Hong Kong: Asian stocks rose Thursday taking a clutch of markets to all-time highs as some of the caution triggered by stock market turbulence earlier this year faded. The jump in share prices saw the bourses in Hong Kong, Australia and Singapore hit record closing highs as investors put aside concerns that a US credit crunch could cause a major economic slowdown. An overnight rise in Wall Street, triggered after General Motors Corp. struck an agreement to end a two-day-old nationwide strike, also helped sentiment in Asia. 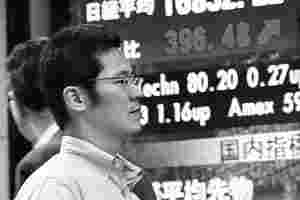 Other Asian markets did well including Japan, where share prices surged 2.4%. Only the Thai and New Zealand markets struggled, with Bangkok closing marginally down and the Wellington bourse ending flat. Hong Kong closed up 2.4%, rising above the 27,000-point level, while Singapore was up 1.77% and Australia was up 0.9%. Japanese share prices surged 2.4% to close at a six-week high, lifted by overnight gains on Wall Street and hopes of solid domestic earnings, dealers said. They said exporters led the way higher as a weaker yen brightened prospects for their overseas earnings. The Tokyo Stock Exchange’s benchmark Nikkei-225 index of leading shares rose 396.48 points, or 2.41%, to 16,832.22—the best close since 14 August. The broader Topix index of all first-section shares advanced 39.13 points, or 2.48%, to 1,615.15. Gainers outnumbered decliners 1,510 to 169, with 34 issues unchanged. Turnover rose to 2.08 billion shares from 1.75 billion Wednesday. Dealers said jitters about the fallout from defaults in US subprime loans to risky borrowers appeared to be abating for now, helped by the Federal Reserve’s hefty half-point cut to US interest rates last week. “The subprime mortgage trouble appears to have eased and the Fed’s rate cut last week, along with expectations of another rate cut next month, have kept financial markets stable," said Kazuhiro Takahashi, equity general manager at Daiwa Securities SMBC Co. Ltd. “But the overall picture is not yet clear and there is a possibility of the market falling again when negative news surfaces." The market benefited from some portfolio adjustment by fund managers ahead of the end of the first half of the Japanese financial year on Friday, dealers said. Shares rose across the board with property stocks, banks and exporters, particularly technology and auto stocks, all higher. Shares of Sumitomo Mitsui Financial Group surged 58,000 yen, or 7%, to 891,000 as Resona Holdings Inc. jumped 24,000 yen, or 13.4%, to 203,000 yen. Gains by export-oriented blue chips were more modest. Toyota Motor Corp. edged up 80 yen, or 1.2%, at 6,690. Share prices in Hong Kong closed at a new high above 27,000 points as futures-related activity and end of September portfolio sprucing by fund managers boosted blue chips, dealers said. They said China Mobile Ltd led gains among large-caps. The Hang Seng Index closed up 634.86 points, or 2.4%, at 27,065.15—off a low of 26,664.79 and a new all-time-high of 27,166.01. The index’s previous closing record was 26,551.94, hit on Monday, while its previous record high was reached the following day at 26,667.24. Turnover also hit a new record at HK$147.05 billion (Rs75,023 crore). The previous high was achieved on Monday at HK$140.04 billion. Hong Kong Exchanges and Clearing Ltd (HKEx) drew speculative interest after a report that the Chinese government could be buying into the stock exchange operator through state-run agencies. “There are no fresh trading leads...but the theme of China fund inflow and direct investment scheme (for mainland investors) continued to support sentiment," said Jackson Wong, investment manager at Tanrich Securities Co. Ltd. “Funds were busy with window-dressing, while investors were also bullish and chased major blue chips and China related stocks." The Hong Kong markets will be closed on Monday for National Day, while mainland bourses will be shut for the whole of next week. Chinese share prices closed 1.33% higher as banks were boosted by a strong rise in newly-listed China Construction Bank Corp. (CCB), dealers said. Energy stocks also recovered from heavy losses earlier this week, creating a positive investment climate for China Shenhua Energy Co. Ltd‘s Shanghai listing on 9 October, they said. The benchmark Shanghai Composite Index closed up 70.88 points at 5,409.40 on a shrinking turnover of 96.15 billion yuan—down from 105.53 billion yuan in the previous session, ahead of the coming week-long national holiday. “The market gained some strength after the recent consolidation," said Wu Feng of TX Investment Consulting Co. “Banks were encouraged by a rally in CCB and pushed the index higher." Industrial and Commercial Bank of China added 0.21 yuan (2.8 cents) to 6.58, while Shanghai Pudong Development Bank Co. Ltd gained 1.69 yuan to 50.40. The Shanghai A-share Index rose 74.40 points, or 1.33%, to 5,677.21 on turnover of 95.07 billion yuan and the Shenzhen A-share Index was up 24.28 points, or 1.57%, at 1,566.74 on turnover of 49.50 billion yuan. Shenhua Energy, China’s biggest coal producer, said it had raised 66.58 billion yuan in the country’s largest domestic initial public offering, after pricing its A shares at 36.99 yuan. Share prices in Taiwan closed 1.69% higher as fund managers boosted their holdings ahead of the end of the current quarter, dealers said. Wall Street’s overnight gains gave the market an initial prod but ample liquidity injected further momentum, keeping the index in positive territory throughout the session, they said. The weighted index closed up 156.18 points at the day’s high of 9,413.65, which also marked the highest level since 9,566.42 recorded on 26 July. Turnover was 183.29 billion Taiwan dollars ($5.55 billion). A total of 53 stocks closed limit-up, while seven were limit-down. The tourism sector was up 5.60%, electronics up 2.54% and financials up 1.89%. The Taiwan dollar ended the morning session at 32.87 to the US dollar, compared with the previous close of 32.93. Tank Hung, manager at Mega International Investment Services, said sentiment was upbeat after equities gained in New York overnight, encouraging fund managers in Taipei to continue buying shares. Indian share prices rose 1.35% to a seventh straight record close, closing above the 17,000 points level for the first time, led by strong US markets. Strong overseas inflows and short-covering on Thursday, on the expiry of the monthly derivatives contract, fuelled the market.